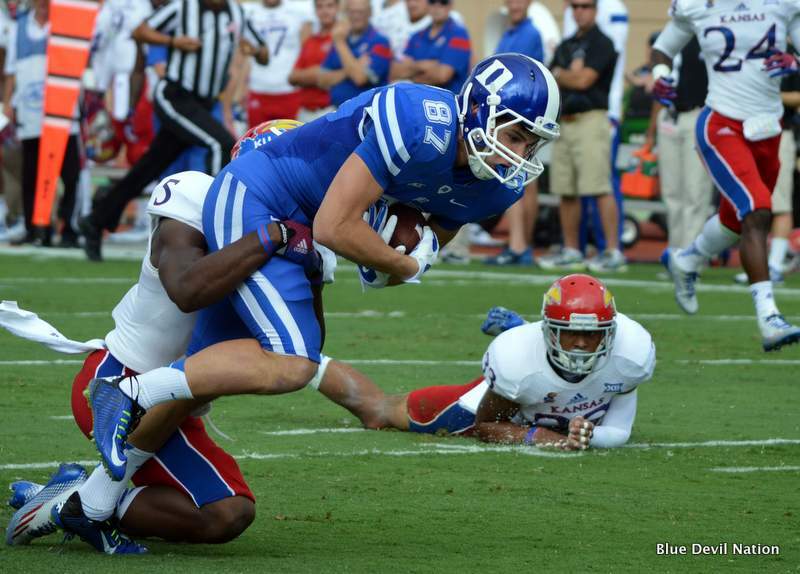 DURHAM - Duke WR Max McCaffrey fought his way into the end zone twice on Saturday as the Blue Devils topped the Kansas Jayhawks, 41-3. 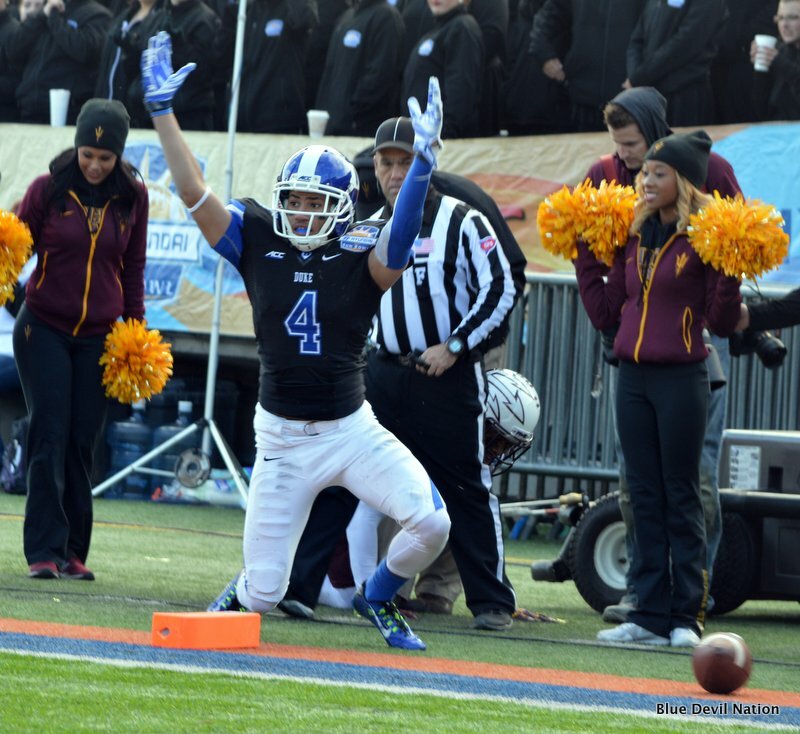 McCaffrey led all Blue Devil receivers with 79 yards and 7 catches on the day. Defensively, All-American safety DeVon Edwards had another big day, hauling in the Blue Devils' first interception on the young season. He finished with 7 tackles. 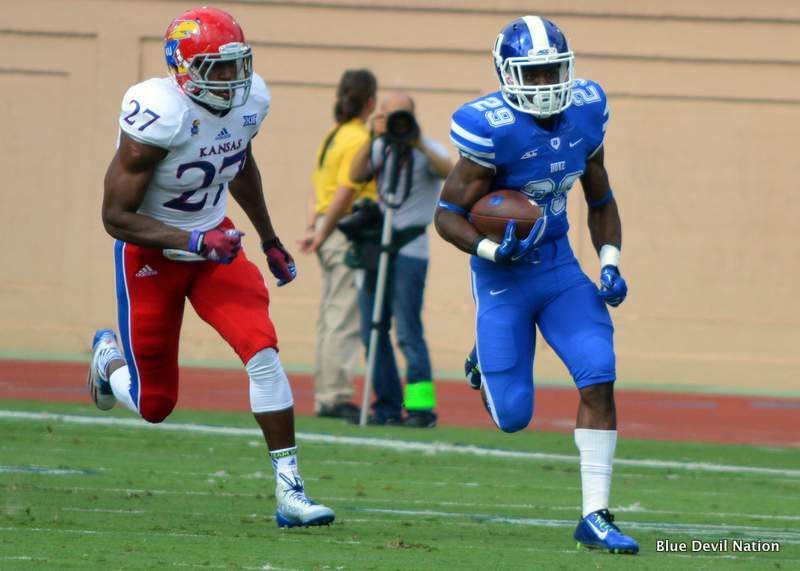 Blue Devil Nation caught up with both McCaffrey and Edwards shortly after Duke's big victory to move to 3-0. One of the key things to watch this pre-season is which wideouts step up to fill the void left by the departed Conner Vernon. 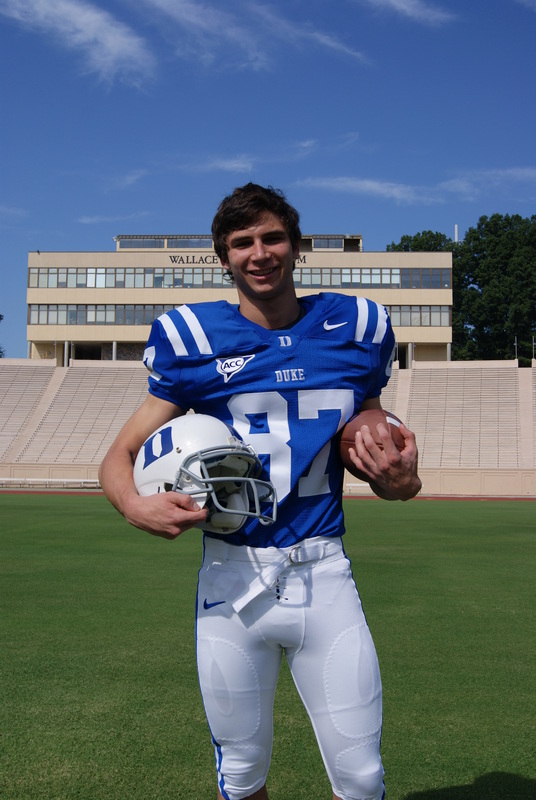 Blue Devil Nation spoke with Max McCaffrey about that earlier today as Duke Football opens practice for the coming season. A lot of pre season buzz suggests you will have to step into Conner Vernon's role from a season ago. Are you prepared for that? I feel prepared for it and there is no pressure. Conner was a good role model and he helped prepare me and I have been able to ease in having played last season. How is your game different from Conner? I think we are a lot different actually. Conner was a great player but I am just excited to go out and play. He was good at the deep ball and where he would use his speed to break off of the defenders, I use more of my body to do so. 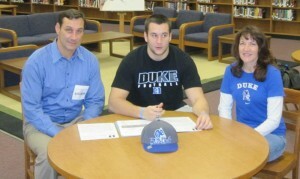 I have had a lot of family members come to Duke and they've all been happy with my decision. 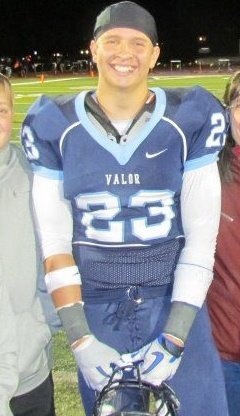 My younger brother was a recruit here too, and my Dad and all are real supportive. Do you deal with mental pressure in trying to fill roles open from a season ago? I don't necessarily feel pressure but it is definitely another role and I feel like I need to produce now. So I need to imprint the guys below me and try to start becoming a leader for this years team. You have caught balls from Sean Renfree and Boone. How do the two differ? Boone and Renfree are definitely two different quarterbacks. I think Boone can make plays that aren't necessarily there in the running game. I am used to passing with him in that he's the player I was paired with in practice a lot last season, so I am looking forward to see what will happen this year. BDN: How did your official visit to Duke go? I’m at the airport right now; I just got done with my visit. It was a fun weekend. It was a lot of fun. They did a great job of hosting it. Definitely the high points were the basketball game, getting to walk around and see the campus for the first time, and just hanging out with the coaches, they are some great guys, they’re funny, and we got along really well. 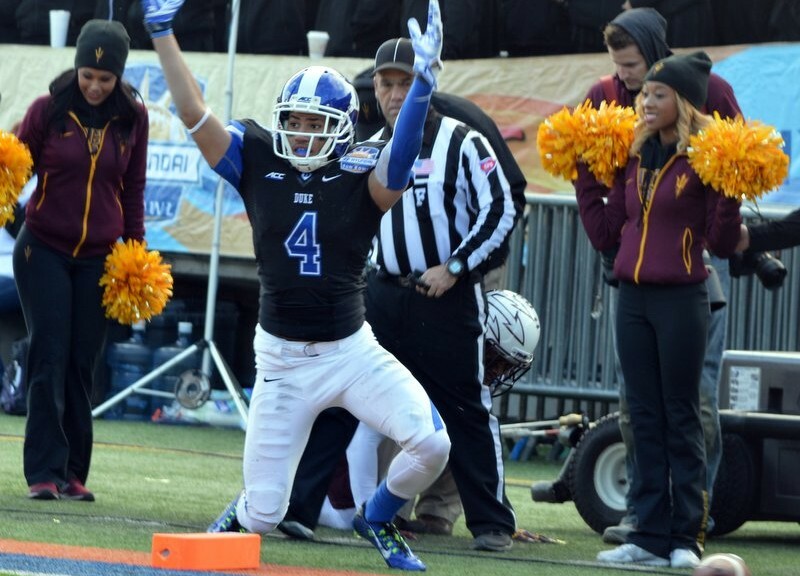 BDN: You had originally committed to Arizona State. Can you talk a little about how Duke entered your recruitment and when you first heard from them? Definitely. I committed to Arizona State in the summer and I was all set and ready to go, but due to the coaching changes and all that stuff, it really opened up things for me. I re-opened my recruitment. 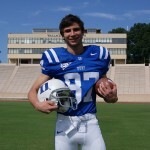 It turns out that my best friend, I think you know him, Max McCaffrey, he goes to my school and he lives right next door. 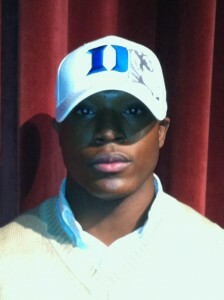 He committed to Duke as well. He’s a great kid and it would be really fun to come with him. But that’s how I got introduced to Coach Lubick. He was out here and was able to see me play and he liked me and that’s kind of how Duke got a hold of me. BDN: What other schools are you considering at this point? I took an official visit to Colorado State last weekend. It’s definitely CSU, Duke, and UCLA. I can still go to Arizona State but I don’t really want to because of the new coaching staff, they want me to gray shirt and all this weird stuff. BDN: It’s obviously always a tough situation when there’s a coaching change. What will be the most important factors as you sit down and make your final decision? Yeah. 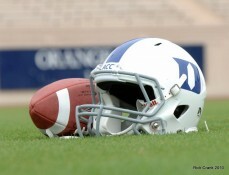 After being at Duke, my priority is definitely to get an education first. 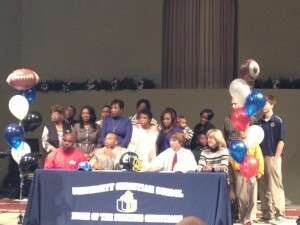 I’m going to college to get an education. AS much as I’d like to play in the league, I’m going to put forth my best effort, but I want to be realistic and know that I’m probably going to rely on my degree one day. That’s very important to me. I want to go into business, so I want a good business school and a good education. Next for me would be the football aspect. And last would be socially and the location. Those are the factors that will definitely come into play when I make this big decision. BDN: Do you have an idea when you would like to make that final decision? I’d like to make it definitely soon. Duke is going to call me, they’re going to keep in touch with me. I’m anxious to hear something from them in the next few days, it could be as early as tonight, it could be by Tuesday, to know officially what I’ve got going on with Duke. BDN: Thanks a lot, Michael, and best of luck. I appreciate that, sir, thank you so much.